There was a 1981 mini-series starring Bryan Brown and Helen Morse. Our narrator is a solicitor by the name of Noel Strachan who is ”as solid as the Bank of England, and as sticky as treacle.” He becomes involved with an estate that seems to be a straightforward affair, but soon it evolves into his most all consuming case. It involves a woman named Jean Paget, to him more of a girl, but as we learn her story, we find out just how much of a woman she really is. Paget’s story is based on true events. This story is set in Malaya, but the real story is set in Sumatra. The women and children taken by the Japanese during the war are Dutch, not British, and Nevil Shute gets many things wrong. Some of that is translation problems, and some of those are changes necessary to tell the story he wants to tell. The Japanese take all foreign nationals in Malaya prisoner. They separate the men from the women, haul the men off to camps, and don’t have a clue what to with the women and children. So they march them in what turns out to be random directions towards mythical camps for women and children that never materialize. With every brutal mile, their ranks are thinned, and the youngest woman among them becomes their de facto leader. She befriends a truck driver from the Australian outback, Jim Harman, who steals much needed supplies at great risk. Eventually, he is caught. ”’I stole those mucking chickens and I gave them to her. So what?’ said Joe. The ’So what?’ turns out to be a very big deal indeed. This is a story that Paget tells to Noel Strachan, and he shares the story with us. Over the course of the novel, she continues to write to him about her life. Despite the age difference and the impracticality of a relationship, it is easy to see that Strachan has fallen in love with Jean Paget, and as it turned out, so did Joe Harman. Joe Harman is based on a real man by the name of Herbert James ‘Ringer’ Edwards. 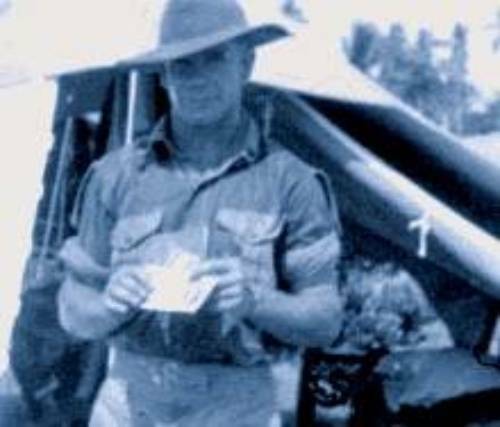 He was every inch the man that Shute describes in his novel. Look at that jaunty angle to his hat. In this edition, there is a wonderful afterword by Jenny Colgan. She makes the case that writers, craftsmen and craftswomen, like Nevil Shute, Bernard Malamud, Elizabeth Taylor, Robertson Davies are largely forgotten by the reading community today. Interestingly enough, I have several books by all these writers in my personal library. I am the consummate pursuer of writers, exactly like Shute, who have been relegated to the past, left for dead, but who are in need of a resurrection with a new generation of readers. He has certainly left his mark on me. I think about Shute’s book On the Beach at least once a week. It is one of my favorite post-apocalyptic books. I have a feeling I will be similarly haunted by A Town Like Alice. Nevil Shute Norway is his full name. To keep his engineering life and his writing life separated, he existed under Norway in one and Shute in the other. He became caught up in the disastrous airship craze between the world wars, and he is brought to life so vividly by David Dennington in his historical novel The Airshipmen. 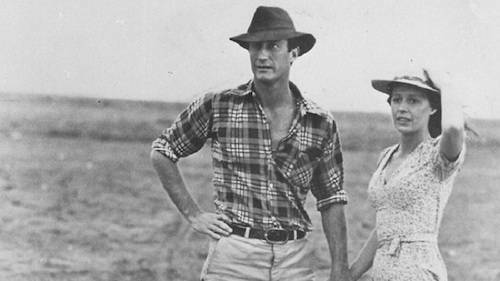 After receiving her legacy, Jean ends up in the outback of Australia, being exactly the can-do woman she was in Malaya. She wants to build the sparse few buildings of Willstown into the next Alice Springs. I find this part of the story so inspiring. She is such an natural entrepreneur. She asks the right questions. What do people need? What do people want that they don’t even know they want it yet? What must we do to make each venture profitable? How does she keep the young women from running off to the big cities? No young women means there are no young men. In many ways, she is like Bugsy Siegel who envisioned casinos in the desert. She wants to build A Town Like Alice. She uses her legacy to build something. There is one major plot twist which is dangled so masterfully by Shute, but the reveal is not a grand fireworks affair. That just isn’t Shute’s style. He brings it in subtly, as if to say,...of course, this is what really happened. Poor Noel Strachan meets the girl of his dreams forty years too late, but fate does at least let him meet her. You, too, can meet Jean Paget and Joe Harman and get to know what poddy-dodging means and ringers, but more importantly, if you love a good story as well crafted as the airplanes you trust your life to, then you should be reading Nevil Shute. His books should not be forgotten. Blow the dust off them in your local library and paperback exchanges, and let his stories live in your mind as they do in mine.